In a biological version of fighting fire with fire, researchers at Lawrence Berkeley National Laboratory (Berkeley Lab) and the University of California at Berkeley are designing a genetically modified form of the HIV virus to prevent HIV infections from developing into AIDS. 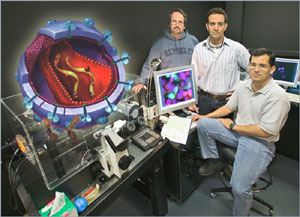 While their model of an HIV parasite, called crHIV-1 (conditionally replicating HIV-1), is yet to be synthesized, it has performed well in computer simulations. "At this time we are nowhere near an AIDS therapy, but our model does show great promise in simulations, and we're very excited about this line of research," says Adam Arkin, who is leading this research. Arkin is a member of the Department of Computational and Theoretical Biology in Berkeley Lab's Physical Biosciences Division and a UC Berkeley professor in bioengineering. Collaborating with him is David Schaffer of UC Berkeley's Department of Chemical Engineering and Leor Weinberger, a UC Berkeley graduate student who was instrumental in formulating the initial concept and subsequent development of the crHIV-1 model. Many members of the public still equate HIV (human immunodeficiency virus) with AIDS (acquired immune deficiency syndrome). Persons infected with the HIV parasite gradually lose their ability to fight off disease and infection. AIDS is declared only when a victim's immune system becomes depleted beyond a critical level; opportunistic infections and other diseases arise as a result. The characteristics of an HIV infection, specifically the presence of long-lived, latently infected cell populations, make it unlikely that it can be completely eradicated through the use of antiviral drugs. An alternative approach is to manage the infection so that it is no longer life-threatening. "The idea is to reduce the HIV virus population and thereby delay or even prevent the onset of AIDS," says Arkin. "This could be done by creating a parasite of HIV, crHIV, that would suppress production of the HIV parasite by converting latently infected cells into a pseudolatent state." When an individual is first infected with HIV, there's a period before the body's immune system kicks in, usually about two months, during which the HIV parasite rapidly reproduces and spreads to other cells. The parasite's primary target is a type of cell in the immune system called a CD4 T-lymphocyte. Following this initial unchecked replication, the virus population stabilizes at a level called the HIV set point. A victim's set point level is inversely correlated with the time to AIDS onset. For a typical HIV positive patient, the set point is maintained for about 10 years. When the number of uninfected CD4 T-cells drops below a critical threshold, the HIV parasite population increases and the HIV infection develops into AIDS. "Recent evidence suggests that reducing the HIV set point below some absolute value may not be necessary," says Arkin. "Rather, the relative extent of the HIV set-point reduction in a patient appears to be a significant predictor of patient health and immune recovery." Currently, the only effective means of reducing the HIV set point is called HAART, for highly active anti-retroviral therapy. HAART drugs are expensive, highly toxic, and can be quickly overcome by resistant HIV mutants. To find something better, Arkin, Schaffer and Weinberger turned to synthetic biology. One of the hottest new fields in the life sciences, the goal of synthetic biology is to design and construct novel organisms and biologically inspired systems that can solve problems natural biological systems cannot. Other researchers have done preliminary in vitro observations of crHIV-1 viruses, but Arkin, Schaffer, and Weinberger are the first to explore what would be needed for a crHIV-1 virus to infect an HIV virus in an organism, then proliferate and persist enough to reduce the HIV set point. To design their version of a crHIV-1 therapy they worked with a widely accepted mathematical model of HIV in vivo, called the basic model of HIV-1. Criteria for their crHIV-1 virus were kept relatively simple. 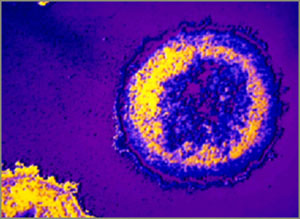 A T-cell infected with HIV is covered with virus particles, which will soon spread. Explains Schaffer, "Our design introduces only two new parameters. The first is the ability of the parasitic virus to suppress HIV production. We've designed antiviral cargos that target the host cell functions that HIV needs to replicate, rather than HIV viral functions that can be rapidly evolved around. The second parameter is the ability of the parasite virus to propagate in parallel with HIV. If our parasite suppresses HIV too much in its host cell, then it can't propagate and spread to other cells to prevent further HIV infection." Schaffer says that when computational modeling of both parameters is complete, this therapy virus will be created in the laboratory and in vitro studies will begin. One of the critical questions to be resolved is the potential for crHIV-1 to be transmitted from one individual to another. This could be a problem or a benefit. As he and his colleagues explained in an earlier paper on this research, which was published in the September 2003 issue of the Journal of Virology, the spread of crHIV-1 through the population might to act to mitigate the spread of HIV and AIDS. The development of this crHIV-1 model is an example of why synthetic biology is generating so much excitement, and why computers will play a major role in the field. Says Schaffer, "Computation can help us apply molecular and quantitative knowledge of basic biology to synthesize smart biological entities and program them for a variety of technological tasks. The design principles elucidated from in silico analysis"  analysis done in the computer  "can then be translated to the laboratory."